The undead take a bite out of the Big Apple in this cool FPS. 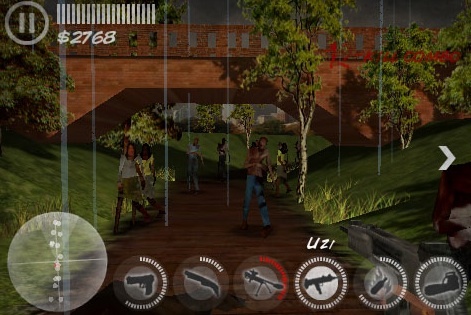 Undead monsters run amok in N.Y.Zombies, an iPhone App with lots of flesh-eating freaks and tons of weapons to kill them with. Available for .99, this well made first person shooter will satisfy your blood lust, but beware. Enemies will tear you apart, even on the simplest difficulty. N.Y.Zombies casts you as an unnamed survivor living in the Big Apple. When zombies transform its inhabitants into a walking buffet, you set off to slaughter enemies in the hopes of making it out alive. Armed with a variety of deadly toys, you simply choose a weapon and then tap the screen (in a zombie's direction, we hope) to open fire. Unlike most first person games, you cannot move the character, aside from panning his/her head 360 degrees. The game drops you in a location (be it inside of a building, city streets, Central Park or some other area) and zombies come from all sides. It's your mission to stand your ground and kill every last monster to proceed. Thankfully, the game has an Aliens style motion tracker that lets you know where the buggers come from, and there's a six-slot inventory that holds a myriad of guns/items, such as a pistol, M16, chain gun, sniper rifle, grenades and a health pack, among other things. Even better, killing zombies and rescuing survivors will net additional cash used to purchase new weapons and/or upgrades. You'll earn well over a thousand with each mission, allowing you to increase weapon strength or save up for a big-ticket item. In addition, the game has 20 achievements to unlock, as well as global leaderboards and Endless Mode, where you see how many zombies you can kill before things get crazy. In all, it's a fun game that offers several hours of enjoyment at a bargain price. Just don't expect to beat it on a Sunday afternoon. N.Y.Zombies gets tough in a hurry. First, it doesn't always have the best lighting, so expect a lot of dark corridors and well-concealed zombies. Second, later missions are borderline impossible. 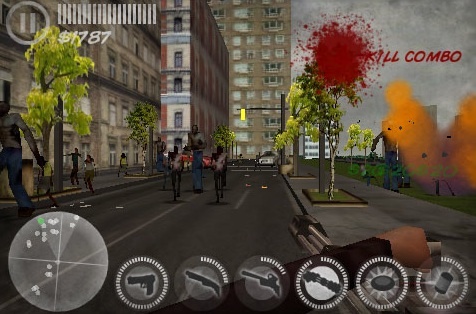 Zombies quickly clog the screen, and some weapons take forever to reload, even if you have half a magazine left. Fortunately, those same weapons automatically reload when not in use, so as long as you manage them effectively, things will be OK.
That said, N.Y.Zombies should be on your radar. While not perfect by any means, this cool and cheap shooter has enough action to keep zombie fanatics busy until the real undead apocalypse arrives. What's Hot: Lots of weapons, cool touch mechanics, multiple zombie types, leaderboards, achievements. What's Not: Too dark, difficulty is borderline unfair.